Bocconcini, a homestyle eatery just off of Philadelphia's Avenue of the Arts (1334 Pine St., 215-545-2482), has embraced what many restaurants ignore, joining its neighbor Giorgio on Pine at the forefront of gluten-free Italian dining in Philadelphia. While other restaurants may add an obligatory gluten-free pasta dish or pizza to their menu without taking precautions to avoid cross contact, Bocconcini is at the other extreme. This makes sense, as the chef-owner of Bocconcini, Crystal Fox, was the one-time chef at Giorgio on Pine, the original gluten-free-before-anyone-else restaurant. In fact, Bocconcini took over the former location of Giorgio Pizza on Pine in 2017. After settling in during a recent visit, our server's first question was whether we were gluten free. I was dining with two friends - one of whom, like me, maintains a gluten-free diet and another who has no food restrictions. As the server brought out a generous, complimentary plate of gluten-free bread, she helpfully explained that the entire standard menu could be made gluten free. Our server explained that the seriousness of avoiding cross-contamination was so important that absolutely nothing with gluten was allowed in or near the fryer. Items that went in the fryer, such as meatballs, universally use gluten-free ingredients like breadcrumbs to avoid the possibility of cross-contamination. In unison, my gluten-free friend and I asked, “Why?” wondering if there was Celiac in someone's family or even if the chef herself had an allergy. Refuting these theories, she explained that Fox is passionate about creating a positive and safe experience for everyone who loves gluten-free food. Bocconcini is ideal for a night on the town regardless of whether one has dietary restrictions. A huge draw for dates or a friends' night out is that Bocconcini is BYOB, which takes the sting out of ordering expensive cocktails and justifies a splurge on pricier menu options or an extra appetizers. Having split two starters and enjoying our own entrées, we walked away paying less than $50 a person - and with leftovers. For appetizers, we enjoyed the fist-sized meatballs smothered in cheese and fried cauliflower served over a fra diavolo sauce. 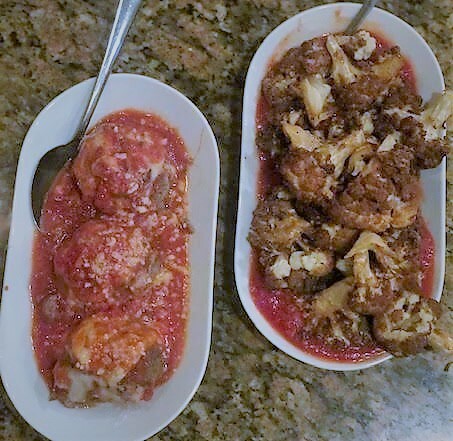 Both dishes were amazing; having meatballs was particularly exciting since most restaurant versions are not gluten free, while the fried cauliflower was surprisingly flavorful - reminiscent of General Tso’s chicken. 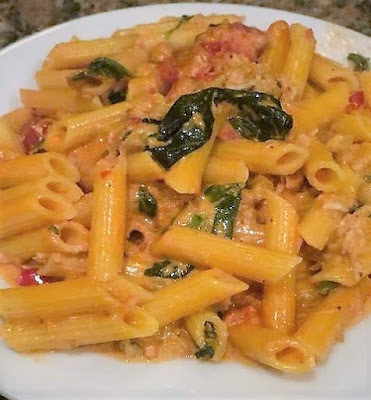 While the menu offers many delicious-sounding options, my fellow gluten-free diner could not resist ordering penne a la vodka with crab and wilted spinach. Meanwhile, our non-gluten-free companion shared the appetizers but opted for a traditional ravioli dish.